We’d like to thank Simon for providing this article for our use. 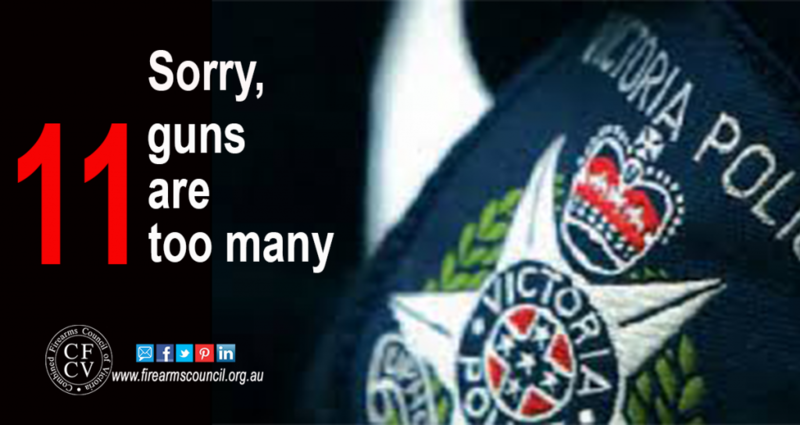 Victorian Police (Vic Pol) is looking into the issue of how many Cat B firearms shooters need. They are writing to people who have lodged a PTA for their 11th or subsequent Cat B PTA requesting more information on why the firearm is needed. The difficulty with this approach is that one could have eleven identical rifles before any question was raised, which is hardly consistent with the intent of the Act. As a former lawyer with a Commonwealth Regulatory body I can however understand why they need to take that approach. I suspect it is because the average processing clerk is not going to have sufficient knowledge of firearms to be able to tell whether another acquisition meets the test. Unfortunately, however I do not think this is the appropriate mechanism. I can however understand VicPol’s dilemma; the National Firearms Agreement sets out a test requiring Genuine Reason / Special Need that is embraced in the legislation that Vic Pol is charged with enforcing. It is their statutory duty. Also to VicPol’s credit, Vic Pol are affording shooters ‘Natural Justice’ and asking them to explain why they need the additional firearm, rather than arbitrarily make a decision based on numbers. Imposing ‘limits’ has been tried before. An acquaintance in the ACT had a daft experience many year ago in the Canberra where, with a left wing single chamber and no upper house to review legislation, daft law and policy abounds. He had two .270’s and came across a rather nice custom Mauser in a sadly now closed Gun shop in Goulburn. It had a good grade walnut stock crafted in the Waghorn style, a rather gorgeous butter knife bolt handle, and some rather basic but classy engraving. In that district, it and its previous owner, had probably accounted for many Fallow Deer. Because the boys in the bush these days like plastic stocked guns, it had a ridiculously low-price tag, and had sat unloved for months. It needed a good home. It was a quality rifle at a more than fair price To acquire it, the acquaintance had to have it ‘rechambered’ so as not to have a third gun in the same chambering. A complete and utter waste of time, money and effort. Similarly, in the ACT, a former Registrar initially sought to deny a .308 owner who wanted a .338 Winchester for hunting Sambar the opportunity. Over in the west, the West Australian Registry allowed a fellow to have a .375 H&H for SSAA big game target use, but would not allow him to have it to hunt Buffalo because they are not to be found in WA; he had a .30-06. I have previously reviewed the ACT ACAT decision of Q v Registrar of Firearms (Administrative Review) 2015 ACAT 84 which dealt specifically with the question of how many firearms a shooter could own and repeat the conclusion from my case note here, as the matter has again become topical. The NFA does not impose clear-cut numbers of firearms that a person may have. A collector could own for example multiple examples of a type if they were acquiring like examples for example, or I would assume if they had a particular reason to acquire a piece that was a ‘good buy’, although care would need to be taken here to ensure that one is not considered a ‘dealer’. Swapping is endemic among collectors. Collections of all sizes, up to and including museums such as the Australian War Memorial, do it all the time in order to further their collections. Indeed, a choice swap item may motivate a deal more than money. So, how many guns do you need? It depends upon what sort of shooting you do and where and when you do it, and your particular needs in the field. A rabbit / fox hunter could need a .22 Rim fire for short range work, a .17 HMR or Magnum for slightly longer shots, where he does not want to let off a cannon that will upset the neighbourhood, a varmint rifles such as a .220, .223 or .22/250 and possibly a heavier windy day varminter, and / or a lighter weight ‘walk about’ varmint rifle. If into shotgunning, subject to where the shooting is, and its frequency, one may need a field weight shotgun, or in hilly country an ultralight, or even possibly if you shoot a lot a heavier ‘sporting’ model. A similar list could be drawn up for any other type of hunting such as pig hunting, and the various types of deer hunting. I have always considered that a hunter could justify at least two rifles that perform the same role on the basis that one is a ‘backup’. The rationale being that most Australian hunters travel some considerable distance to hunt, and are often in a location where it is not possible to check the zero of a firearm, and firearms today generally lack back up sights, and, as they hunt without the benefit of a professional hunter or guide, there is no possibility of saving a hunt by borrowing a ‘loan gun’. It all comes down to the question of having a ‘genuine need’ and having the public safety angle well covered, of course, with the proviso that the more firearms you have, the more closely your ‘genuine need’ may be scrutinised. While this case deals with the ACT legislation, the framework is similar to that under all of the state and territory acts giving effect to the National Firearms Agreement, in that they all in effect make ownership a privilege conditional upon public safety, and establish a genuine reason / special need test. As no Tribunal decision is a binding authority, Q would not bind a Tribunal anywhere in Australia. However, as indicated, it is a well-reasoned decision from a highly respected Tribunal, and I believe that the approach adopted would therefore be influential upon tribunal charged with decision under other acts purporting to implement the National Firearms Agreement. I note in passing that both of the cases listed above occurred under a previous Deputy Registrar in the ACT to the one now serving. Shooters are understandably unhappy about knock backs regarding PTA’s. I have had a couple of calls from Victorians regarding this. I recommend caution before running test cases in this area. There are some shooters in Victoria who have upwards of fifty firearms on hunting licences, who may experience difficulties with the above interpretation. One fellow rang me about wanting to ‘mount a Crusade’. I suggest he not only study the law, but also history. As many of you know, Tribunal decisions are not precedents’. Technically you may be right, but I would add that arguing with our licensing agencies on precedent alone rarely works. There are other arguments which may be able to be used. When I approach firearms matters, I try to not only be ‘tactical’ in addressing a client’s needs but also ‘strategic’ in considering its consequences for the movement. I discuss the ‘strategic picture with the client as part of helping them form a decision about action that they need to take, and encourage other shooters to do the same. Simon Munslow practices extensively in Firearms Law matters throughout Australia and is a regular contributor to the Australian Sporting Shooter magazine’s website on Firearms law matters, has published articles on firearms reviews and firearms law, and occasionally is asked to comment in the broader media on firearms matters. personally this is far less about public safety and more about control of the law abiding and being seen to do something without doing anything so that they can get more power for themselves. they are totalitarian traitors who must be dealt with harshly before every australian looses ALL freedom and are transformed from economic slaves as we basically are now to literal slaves as used to happen.